BINTI!! I’ve been highly anticipating this novella since finding out about the Tor.com Publishing program. There are certain literary devices that I find especially compelling when it comes to writing short fiction. Though it’s a shorter narrative, authors amaze me with how much subtle, but full of impact themes and messages that can fit within the story. With Binti, we are introduced to the Himba culture that lives on earth and uses a clay-like substance called “otjize” to cleanse and purify themselves, she also wears many bracelets and anklets on her body, which jingle when she walks. There are stigmas associated with their use of otjize from other people, namely the Khoush. They think it smells or they are not clean enough, but Binti shows these people that she is just as smart as they are, and these cultural differences, stereotypes, and prejudice are unfounded. 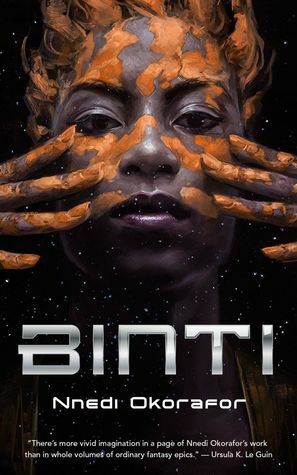 Okorafor lulls readers into a sense of security while Binti is traveling to Oomza University on another planet. She’s the only Himba person on a ship with many Khoush people. We get a sense that she’s finally happy, but she doesn’t want to leave her culture behind. She still uses otjize, it’s part of her identity. She doesn’t need to leave it behind in order to fulfill her dreams. But then the major turning point happens and I felt gutted (trying to avoid spoilers here). I wanted her to get with the boy she had a crush on. I wanted her to keep these friends through her university life. While still on the ship she has to survive with the Meduse species (a group who also come with their own stigmas and stereotypes: rage, war, power). Binti is able to communicate with them and ultimately save thousands of people when they land at the university. She gains a friend of one of them, in order to communicate, they had to trust each other. The message that I got from all of this is that opportunities come in all forms. Understanding a culture and respecting that culture goes a long way. I feel like I learned a lot by reading this novella, acceptance of different cultures, tradition, importance of education, among many other things. I was deeply impressed with Okorafor’s writing and I definitely plan on reading more of her work. I was confused in some cases with how the edan worked (the device that she used to communicate with the Meduse), which accounted for me giving this 4 stars. However, I will still highly recommend this to all sci-fi and fantasy fans.